A room looks wonderful with a fresh coat of paint. But if you have a “Love-Hate” relationship with painting, you’ll want to read our tips on getting a great finished product. You might even enjoy the project as much as the finished product! You’ll enjoy the job more if you get everything together at the start. Organize a tool station in the middle of the area you’ll be working in. Gather together your paint, brushes, rollers, hammers, screwdrivers, plastic bags, plastic wrap, rags, paint can opener and drop cloths. Don’t try to get everything done in one day. Use the day before painting day to gather furniture in the center of the room, patch cracks and holes, put blue painter’s tape around doors and windows, and cover wall and ceiling light fixtures (light bulbs removed, of course!) with large plastic bags. If you can, clear out all the furniture and accessories. Take everything off the walls. If you can’t move everything out, place the furniture and lamps in the middle of the room and cover them with a good drop cloth. Be sure that you tape the cloth around the furniture. Then put a second cover of plastic or old sheet over everything. It may seem easy painting around door knobs or cabinet hinges, but unless you’re a professional or very experienced painter, you’re bound to get drips around. So carry some zip lock bags and remove all cabinet knobs and hinges, door knobs, light switch plates, outlet covers and light fixtures. Place the pieces together in separate bags and clearly mark the contents and location (top left cabinet, bathroom door, etc.) you took them from. This is a great time to clean the hardware! Put them back when you’re done painting. No matter how hard you try, you’re bound to get drips (or more) of paint on whatever you’re wearing. So take off all jewelry and reserve some old, but comfortable, clothes for your painting jobs. Slip-on shoes are easy to take off if you need to leave the room. You won’t have to worry about tracking drops of paint into other rooms. When you paint the ceiling, put a scarf, shower cap, or old baseball hat over your hair and some plastic over your eyeglasses. If your walls have holes or cracks, fix them before you start painting. Any home center or paint store has knowledgeable personnel to guide you to the best products for the job. Wide cracks and large holes can be “bridged” with fiberglass tape, spackle will fill small holes and cracks and texturizing products are available to match your existing wall finish. 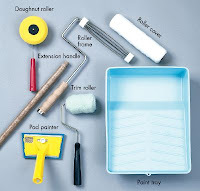 Rollers, pads, brushes, painter’s blue tape & paints. Every year, new products come on the market to help make painting more enjoyable. You’ll want to select the best ones for your job. Paint brushes with natural bristles are meant for oil-based paints. Natural bristles will soak up the water and go limp in water-based paints. The newer synthetic bristles were designed for water-based or latex paints, but can be used for anything. Densely packed bristles that taper to a chisel edge help with painting a straight edge, cutting in or tipping. Split ends or “flags” hold more paint and spread it more evenly and smoothly. Choose the right brush for your job. Foam brushes come in many widths, inexpensive and great for small jobs or touch ups. Foam paint rollers work well, don’t spatter the paint and are easy to use when you want a really smooth wall. Don’t try them on rough surfaces because they will not hold up. Smooth pad painters offer simple and neat paint application and easy clean ups. Don’t apply too much paint to the pad because it will drip. You’ll have to take it apart, clean it, dry it thoroughly and start over. A paint roller with a plastic core will last longer than one with a cardboard core. Select a roller “nap” (fullness of the covering) according to the texture on your walls. Use a flat, smooth roller for flat, smooth walls and a thicker, more plush roller for rough textured walls. New latex paints are formulated to be environmentally-friendly. Drying time is short (usually about 1 hour) and clean ups are easy with water. Apply water-based paints with rollers, pads, or synthetic bristle brushes. Latex paints tend to get a “skin” of paint in the can when they begin to dry out, so keep the can covered as much as possible. Pour paint into another container to work from and close the can. 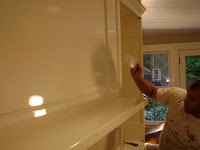 Most professional painters prefer oil-based paints, especially for cabinets, furniture, and trim. New formulations do not harm the environment and are not toxic. Because they dry more slowly, oil-based paints allow for better coverage and work well in warm, dry climates where water-based paints would dry too fast. Apply oil-based paints with pads, rollers, or natural bristle brushes. Clean up with paint thinner or other solvent. The best material for a drop cloth is a heavy canvas cloth. It’s not as slippery as plastic and covers better than newspaper. Fold the cloth to fit any size room and tape down the corners to prevent paint from oozing over the edge. To prevent scratching, be sure to vacuum hardwood floors before you put the drop cloth down. Most paint jobs work better when you use a primer or base coat. Have the primer or base paint tinted to match your surface paint color. You may be able to avoid a second coat of finish paint. For ceilings, try paint that is specially formulated for ceilings. Some brands go on light blue and change to white when dry. This makes it easier to see where you’ve already painted. If you’ve never used painter’s blue tape, why not? It has a waxy coating to keep paint from seeping through, is available in several widths and provides a perfect straight edge for painting. It will not pull up the paint on the surface it’s stuck to and the seal is activated when you put it down onto a smooth surface. Its special properties don’t last forever, so don’t leave it on the wall more than a couple of days. Even if you’ve done a great job, some clean up will be required. You’ll have to do some touch ups and put things away. You won’t want to clean your paint brush or roller every time you need to take a break. Wrap them in plastic wrap and seal them in a plastic bag. They’ll be ready and flexible when you return from your break. For longer storage (as much as a week), put the plastic bag with brushes in the freezer– yes, the freezer! Thaw out the brushes for an hour before you use them again. No painter would be without a supply of rags. You’ll undoubtedly need to wipe off excess paint, catch drips, clean up spills or wipe off your hands. Scrape excess paint or drips from windows, tile, or glass with straight razor blades. The drips won’t smear, and the surface will be perfectly clean. When you’re done painting, take time to soak your brushes or rollers with latex paint in a solution of water and laundry fabric softener for about 10 minutes. Swish them around in the water, remove them and rinse well with clear water. Before putting them away, wipe or roll off excess moisture and air dry the brushes and rollers . No need to save a big can of paint to store just the little bit left over. Use a glass jar or pint size paint can to store excess paint. Remove the paint can label or mark the new, smaller container with important information. Include the date the paint was used, the color name and number, where it was purchased, the room where it was used and where (wall, trim, etc.) If you have it, attach the paint swatch from the paint store. Use small baby food jars or food storage containers to store small amounts of paint for touching up scratches or dents. Fill them with leftover paint, label where the paint was used (kitchen cabinets, master bedroom ceiling, etc.) and what type of paint it is (latex flat, oil eggshell, etc.) and place the containers in sealing plastic bags. When you need to make a small repair, shake the container well and dab on a spot of paint with a small foam brush or Q-tip. If you don’t feel like cleaning your brush or roller at the end of the day and expect to get back to painting within a few days, wrap the brush or roller tightly in a plastic bag and put in the freezer. And remember to always paint from top-down!